Businesses today collect, use, and maintain a wide variety of data… from Customer Relationship Management, to point-of-sale, order tracking, inventory, shipping, and financial reporting. It is all too easy to wind up with stand-alone packages for each key business function. Another option, one that maximizes efficiency and minimizes human interaction, is System Integration. System Integration means data transfer from one system or software package to another is automated. In other words, data feeding directly from one program to another, without human intervention. When system-to-system data flows are automated, valuable human resources are freed to concentrate on managing and interpreting data. Making more sales. Helping customers. 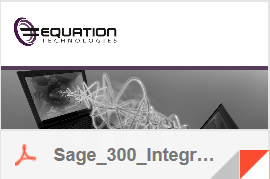 Equation Technologies maintains a programming staff capable of automating/integrating the communications between a number of stand-alone software programs with a particular expertise in Sage 300 (Accpac) Integration. It's all about the most efficient use of human resources.